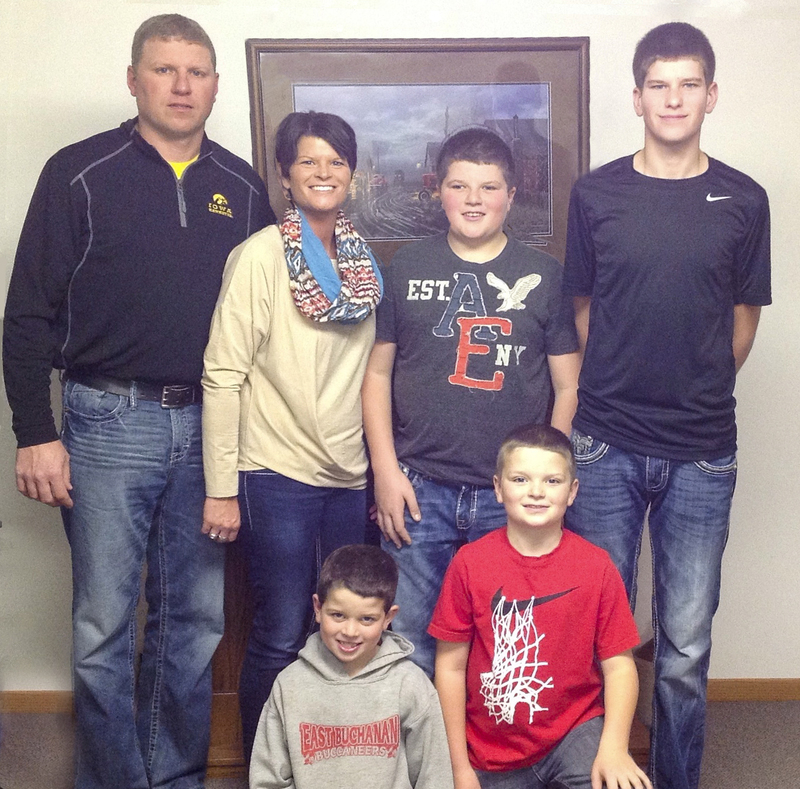 For Iowa pork producer Ben Reck and his family, that was the driving factor in becoming partners in the Pipestone System. And, for 10 years, it has been a successful partnership that has allowed the Recks to focus investments and upgrades to other parts of their operation. Ben and Amy Reck live near Winthrop, Iowa, about 35 miles east of Waterloo, where they farm with his parents, Doug and LuAnn. They finish about 13,200 pigs per year, raise corn and soybeans on about 1,500 acres, and have about 25 cow/calf pairs. Ben and Amy have four sons, Hunter (16), Riley (13), Gavin (9) and Owen (7), who are also starting to get involved in the farming operation. Ben graduated from East Buchanan High School in 1996 and completed an ag production course at North Iowa Area College in Mason City. He began farming with his father and grandfather in 1999, including taking a 50 percent ownership in raising pigs with his grandfather. Just before Ben joined the farm, his father and grandfather put up a finishing barn and rented a 300 head farrowing operation. When the Silver Top sow farm was being planned, it looked like a good fit for their family and farm. “We were looking for options to have a consistent supply of pigs for finishing, but knew we would have to update or rebuild outdated buildings in order to continue having a sow herd. We also knew that limited labor availability would continue to be a challenge,” said Reck. Ben and Amy and Doug and LuAnn were part of the original shareholder group in 2006. Working with Pipestone has been a very positive experience that fits well into the Reck’s farming operation. They receive about 1,050 pigs every 8 weeks. Receiving pigs from the Silver Top sow farm has allowed the Recks to make other improvements to their farm. They finished a new 1,200 head finisher barn in fall 2013 and constructed their own feed mill in 2010. Reck has also been impressed with the farmer shareholders in the Silver Top barn. If farming doesn’t keep Ben and Amy busy enough, they are both very involved in school, sports, and community activities. Ben serves on the Winthrop Commercial Club, coordinates the community’s little league program, and is vice president of East Buchanan Booster Club. Amy is an elementary teacher’s associate at East Buchanan schools and serves on the Dollars for Scholars committee.